Eric Buchman is drawing some inevitable comparisons to Joe Cada after winning a $1,500 Stud tournament along with $118,785. He finished fourth in the 2009 WSOP Main Event ($2.5 million) while Cada won the same tourney. Buchman just won his second-career bracelet in Event #34 this year and Cada did the same in Event #32. And both players have had several close calls in their bid for another bracelet, with Buchman finishing second and third in a couple of 2011 WSOP tournaments. Moving past the Cada comparisons, Buchman beat a 345-player field to win a 2014 WSOP $1.5k Stud event. He had a tough showdown to complete the victory since his heads-up opponent was Alex Kravchenko, a fellow bracelet winner who was playing on his eighth final table. Buchman started with a 2-1 chip advantage, but Kravchenko quickly evened things up through some expert play. Despite losing his edge, Buchman continued playing strong and was eventually able to eliminate the Russian. Thanks to the victory, he runs his career tournament winnings up to a very impressive $4,260,305. For a guy who only started playing live poker tournaments in 2011, Brian Yoon is doing pretty well for himself. Two years after kicking his live tourney career off with a 58th-place finish and $131k cash in the 2011 Main Event, Yoon went on to win the 2013 WSOP Little One for One Drop and $663,727. 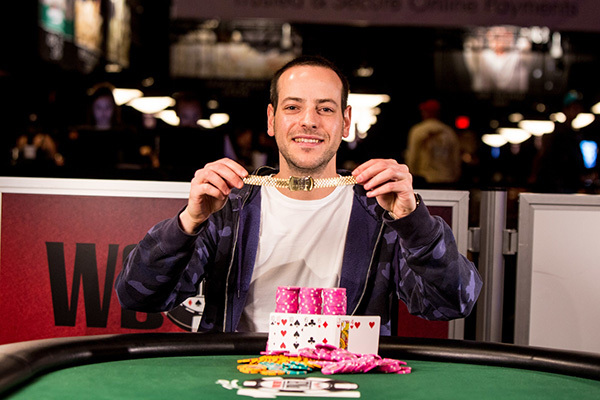 Now he’s got a second gold bracelet after winning a 2014 WSOP $5k Eight-Handed NLHE tourney and $633,341. From a pure numbers perspective, Yoon’s second bracelet victory was far easier. After all, he faced a field of 4,756 players in the Little One, but a 550-player field in the Eight-Handed tournament. But from a competition standpoint, Event #35 was quite tough due to a large number of pros involved. Case in point, Yoon faced two-time bracelet winner Josh Arieh heads-up for the title. The HU match was a little anti-climatic, though, because Yoon only needed 19 hands to beat Arieh ($391,575). With this victory, the California native pushes his career tourney earnings to $1.67 million. When it comes to near-gold bracelet heartbreaks, Steven Wolansky may top anybody’s sob story. Wolansky was dominating his heads-up opponent, Canadian Michael Malm, in a 2013 WSOP $2.5k Eight Game Mix tournament. At one point, the Cleveland-born player had a 28:1 chip advantage on Malm. But in a cruel twist of fate, he lost this advantage and settled for second place ($139,034). Perhaps he’ll have an easier time getting over this loss now because he topped a 241-player field to win the $1,500 NL 2-7 Draw Lowball tourney and $89,483. Wolansky faced 2010 November Niner Joseph Cheong heads-up, and Cheong took a 3:2 chip lead at one point. But Wolansky was able to battle back and win his first gold bracelet along with some redemption. One more interesting tidbit from Event #36 is that German footballer Max Kruse ended up taking third ($36,494). The striker was supposed to be on Germany’s national team for the 2014 World Cup since he played in many of the qualifiers. However, he was replaced at the last minute and chose to play in the 2014 WSOP during his free time. It’s too bad that Kruse couldn’t have won a gold bracelet here to replace the gold he may miss out on if Germany wins in Brazil.